There are two broad types of geospatial predictive models: deductive and inductive. 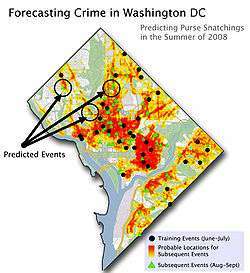 Crime Forecast of Washington DC. Red and orange colors indicate areas of high risk. The risk assessment was generated using an inductive predictive modeling tool called Signature Analyst. Signature Analyst is used to analyze past events and predict where subsequent events are most likely to occur. The deductive method relies on qualitative data or a subject matter expert (SME) to describe the relationship between event occurrences and factors that describe the environment. As a result, the deductive process generally will rely on more subjective information. The means that the modeler could potentially be limiting the model by only inputting a number of factors that the human brain can comprehend. Between 100 and 700 meters from airports. In the grassland land cover category. At elevations between 1000 and 1500 meters. In this deductive model, high suitability locations for the set of events are constrained and influenced by non-empirically calculated spatial ranges for airports, land cover, and elevation: lower suitability areas would be everywhere else. The accuracy and detail of the deductive model is limited by the depth of qualitative data inputs to the model. The inductive method relies on the empirically-calculated spatial relationship between historical or known event occurrence locations and factors that make up the environment (infrastructure, socio-culture, topographic, etc.). Each event occurrence is plotted in geographic space and a quantitative relationship is defined between the event occurrence and the factors that make up the environment. The advantage of this method is that software can be developed to empirically discover – harnessing the speed of computers, which is crucial when hundreds of factors are involved – both known and unknown correlations between factors and events. Those quantitative relationship values are then processed by a statistical function to find spatial patterns that define high and low suitability areas for event occurrence. Donald Brown, Jason Dalton, and Heidi Hoyle. Spatial forecast methods for terrorist events in urban environments, In Proceedings of the Second NSF/NIJ Symposium on Intelligence and Security Informatics, Lecture Notes in Computer Science, pages 426–435, Tucson, Arizona, Springer-Verlag Heidelberg, June 2004.